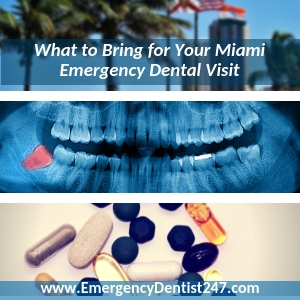 Finding an emergency dentist in Miami during the late hours of the night and on weekends, especially on Sunday, can be impossible. 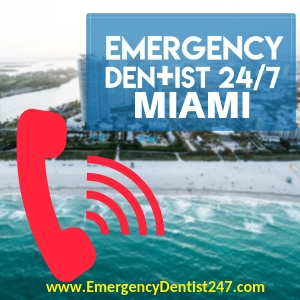 Patients who struggle to find emergency dentist Miami help are the reason why this 24-hour emergency dentist referral network has been created. No matter the time of day, calling us at (855)-352-6790 ensures that we’ll have an appointment booked for you in your name within a minimum of 24 hours. Don’t wait for your dental emergency to get worse – call us now. Because you’ll no doubt have some questions and will be required to fill out paperwork that goes toward your patient profile, it’s crucial that you arrive at least 15 minutes before your appointment is due to start. If you’re feeling anxious or scared, don’t be afraid to mention that, as well. Knowing what you’re feeling will help the emergency dentist and their staff keep you as comfortable as they possibly can throughout your appointment. Dental emergencies are typically the result of some incident or accident, such as a fall that knocked out tooth out, for example. However, a lot of dental emergencies are caused by an underlying oral health issue that wasn’t noticed in time or was just ignored for however long. No matter the circumstances, any head trauma must be dealt with first. Losing a tooth or having one knocked out is scary enough, but not getting any sustained head trauma treated first can be even scarier. 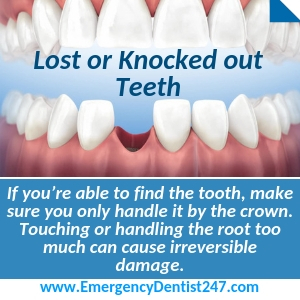 If you found the lost or knocked out tooth, make sure you only handle it by the crown. Handling it by the root can cause irreversible damage that will make it impossible for the emergency dentist to replant back into the empty socket safely and successfully. Rinse the tooth off gently with water before making your next move. At this point, you can either try to put the tooth back into the socket as a temporary measure, or you can store it in a cup of milk or water and bring it with you to your appointment. Oral infections are not a joke and should never be taken lightly. Just like a bodily infection, they have the potential to spread, go into your bloodstream, and become fatal if they aren’t treated in time. Because they’re incredibly painful, you’ll know when you’re dealing with an oral infection. However, there is a way to figure out if one is developing before you keel over from the pain. Check your entire mouth for anything that looks like a pimple or a small, red bump. If you find one, or suspect you have an oral infection some other way, call us immediately. Time is not on your side with any infection. 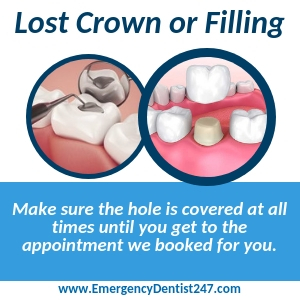 Fillings and crowns are put in place to preserve and protect a tooth from further harm, so when one falls out, you must act fast. Leaving the tooth open and exposed to potential damage can ruin the tooth completely, causing the emergency dentist we book you with to call for an emergency tooth extraction instead of refilling or recapping the tooth. Dental cement, cotton balls, and even small pieces of gauze are all things you can use to protect the tooth until you can get to your appointment. Whatever you choose to use, make sure you are consistent and keep the tooth covered at all times. Being told you need to go through an emergency tooth extraction can be a scary situation, especially if you are being told on the spot at the very last second. A numbing agent will be used to ensure no pain is felt whatsoever – just a bit of pressure when the tooth is being removed. The tooth will either be removed whole or by being broken up carefully into smaller pieces. Once the tooth is removed and you’ve had a moment to relax, the emergency dentist or someone from their staff will go over aftercare instructions with you. You will need to follow their instructions at home to keep the extraction site clean and free of infection. Malfunctioning or broken dentures are just as much of a dental emergency as broken teeth. It can be hard to find emergency denture repair Miami, so we’ve made sure to have emergency dentists who work with denture lab technicians to our network. This means we can now offer patients same day denture repair in Miami for patients who require denture repair or a fitting for a brand new set. There will be times where both an emergency dentist and an emergency room doctor are both needed. For example, you’ve been in a car accident and have both physical and oral injuries. The most important decision you need to make is where you need to go first. Emergency dentists can save your teeth, help with your oral injuries, and help you deal with whatever amount of pain you’re in to a certain degree. They can’t, however, treat any sustained head trauma. Emergency room doctors can treat your physical injuries, help with your pain, and treat your sustained head trauma, but they cannot save your teeth. If you need to see an emergency room doctor first, we can book you an appointment with an emergency dentist while you receive treatment, so call us at your earliest convenience.